Jane Prestebak has been the Program Directory for Media and Instructional Technology at Robbinsdale Area Schools for 13 years. 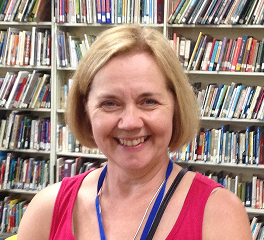 She has worked with libraries and instructional technology in Minnesota, Colorado, Vermont and Japan. While earning her Master’s Degree in Librarianship and Information Management at the University of Denver in 1984, Jane discovered spell-check and online searching. She’s been a cheerleader for learning with technology and information tools ever since.